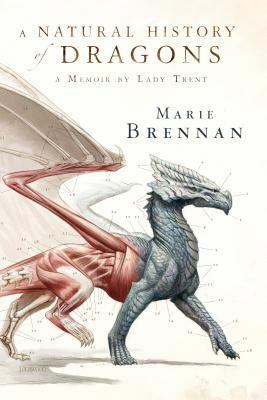 Posted on March 6, 2013	by Katy K.
I’m not the first to say it, but A Natural History of Dragons feels much like a combination of Naomi Novik and Elizabeth Peterson, with an intrepid lady explorer in what feels like the 18th century. Isabella, Lady Trent, is writing her memoir of her younger days and how she became a famous dragon naturalist. Even as a child, she was mad about dragons. She captured and learned how to preserve the tiny sparklings, cousins of dragons that were at the time considered to be insects. After subtly encouraging her father to buy it for her, she pored over the only reference work on dragons then available, and when she came out, considered herself beyond fortunate to find a man, Jacob Camherst, who shared her interest in dragons and would share his library with her. Their relationship was tested early on when she heard about a dragon-studying expedition headed to the wilds of Eastern European-like Vystrana. At first, she was content to cultivate the friendship between her husband and Lord Hilford, the leader of the expedition. Then, she talked him into allowing her to come along. In Vystrana, they find their host missing, the villagers unwelcoming, and the dragons both unexpectedly aggressive towards humans and elusive. Because of this, the expedition that was meant to be focused on dragons turns into a mystery in large part, with less focus on the dragons. It was still largely enjoyable, though more dragons would have been fun. As she came along as secretary and artist, the book includes her sketches of Vystrana and the rock-wyrms they were researching. I was shocked by an unexpectedly tragic ending after the lightness of the preceding adventures. However, there are some issues with the book. It’s set, it says, in Scirland and other neighboring countries, but though the provide maps showed some global differences, culturally and climate-wise, there was no difference between England and Scirland. (It’s possible that the dominant religion is Judaism rather than Christianity, but I’m inferring this from one brief reference.) Naomi Novik proved that you don’t need to move things out of England to have dragons; why bother to confuse the reader with remembering which city is an analogy of London if you’re not going to do something different with it? More importantly, as Thea of the Book Smugglers so eloquently describes at Kirkus, all of the prejudices against those of other cultures and classes that one would expect an 18th century Englishwoman to have are preserved. Also, it takes a good while for her to get through her childhood and actually go on the dragon-researching expedition. She spends a lot of time saying that this was just the first of her adventures. I hope that her memoirs are continued and that they have more in the way of dragons and of challenges to Lady Trent’s worldview. This entry was posted in Books and tagged Fantasy, historical fantasy. Bookmark the permalink.